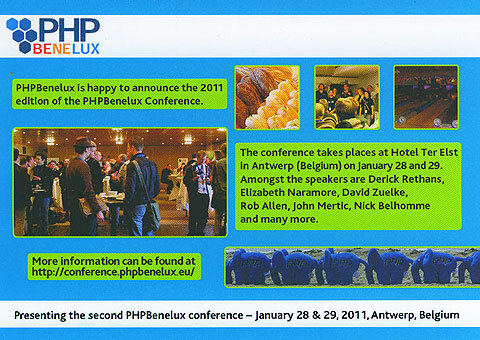 I am happy to announce I will be speaking at PHPBenelux Conference 2011. That means you will learn something about namespaces in PHP. If you never worked with them before or aren’t feeling very confident using them, attend this presentation. Namespaces are a crucial tool that should be found in every PHP developers toolkit (don’t be a dinosaur and in a couple of years a fossil). If namespaces is not enough for you to attend this awesome conference, maybe the other speakers do the trick. Amongst several others are Rob Allen the main author of Zend Framework in Action and a contributor to the Zend Framework. He is also a member of the Zend Framework Education Advisory Board and will be giving a talk that will introduce Zend Framework 2 and look why it has been created and what’s different compared to ZF1. Derick Rethans most famous for creating Xdebug, a tool every PHP developer uses on a daily basis (you practice Stepping and do unit tests right?). He is also the author of several books and will bring his geolocation know-how to the scene. Elizabeth Naramore co-author of several PHP books and community development manager at Geeknet which includes sites such as SourceForge, Slashdot, Geek.com, ThinkGeek. She will jump start the conference as a keynote speaker. Still not convinced? Check the many high profile speakers who will be attending. You should register your seat now, and look forward to ride a highway of information, plunge into networking (the social bowling event will help with that!! Whaaat there is a bowling alley? Yes there is!) and generally have a blast of fun!